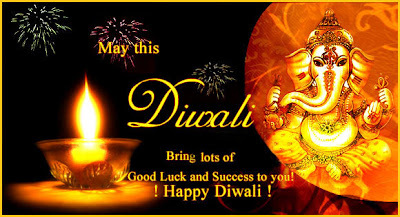 Diwali or Deepavali, the Festival of Lights, is one of the biggest and popular festivals of India. Celebrated with great enthusiasm, the festival is marked by multi-colored Rangoli designs, special rituals, lighting of lamps, floral decorations, fireworks, exchange of Diwali sweets and gifts. As per Hindu calendar, this five day festival is celebrated after 20 days of Dussehra. Diwali celebrations begin on the 13th day of the dark fortnight of the month of Ashwin (October/ November) and falls on the Amavasya -the 15th day of the dark fortnight of Ashwin. The festival of lights concludes on the 2nd day of the bright half of Kartika. Diwali commemorates the return of Lord Ram after a 14-year exile in the forest and his victory over the Ravana. The word is taken out from the Sanskrit word Deepavali - 'Deep' means diya (small pots made from clay) or light and 'Avali' means a row - meaning a row of diyas or array of lamps. Thus the festival is celebrated by placing small diyas, candles and lamps all over the home. In 2019, Diwali Festival date is on 27th October Sunday.